Women’s Wellness Wednesday: Your Bleaching Cream May Be Darkening Your Skin! Dr Donnar Chukwuedo of Kleinburg Medical takes us through the harmful effects of steroid-containing bleaching cream. Skin lightening is fast becoming a common trend especially among dark skinned people. Most people in their quest for lighter skin simply purchase Over The Counter (OTC) skin formulations tagged as skin lightening or brightening treatments and pay no attention to the actual contents of these products. Most skin bleaching products contain compounds known as steroids. These compounds whether in the form of mild forms e.g. hydrocortisone or moderate formulations e.g. clobetasone and triamcinolone or more potent forms like betamethasone, methylprednisolone, clobetasol and diflucortolone; when used for long periods on the skin cause both local and systemic side effects. Steroids lighten the skin through different ways. They reduce the production of Melanocyte Stimulating Hormone, a hormone responsible for activating melanocytes (cells responsible for producing the dark pigment melanin). Steroids slow down the process of cell division. This means that the speed of regeneration of skin reduces. In addition, they constrict blood vessels and cause reduced supply of blood to the skin. This makes the skin appear white. 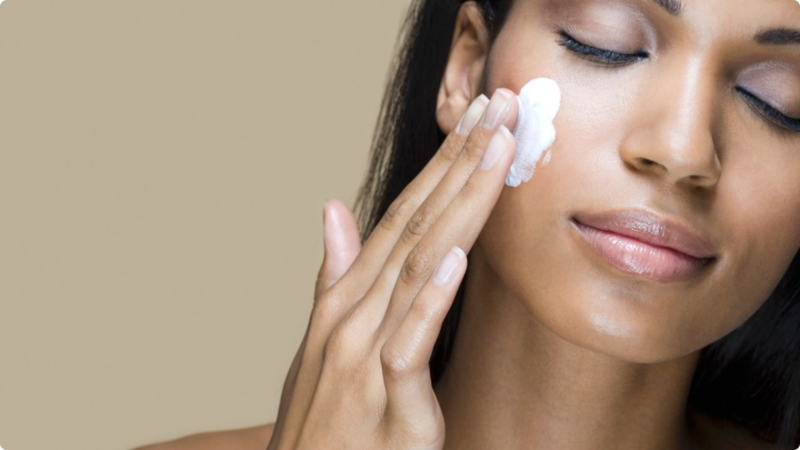 Are you guilty of purchasing OTC skin lightening creams, shower gels or body wash? Have you noticed changes in your skin like thinning of your skin, green veins, redness, stretch marks, widespread bruises, slow healing of your wounds, thickening of hairs on your skin, constant itching, infection, irritation or burning of your skin? It is likely that product contains a steroid and you need to stop using it immediately!! Long term application of steroids can also cause acne, premature aging and can give the skin a bluish grey appearance (see picture above), a condition called Exogenous Ochronosis. 1. Chronic steroid use can cause elevated blood pressure and sugar levels conditions known as hypertension and diabetes respectively. 2. Steroids are also responsible for a condition known as Cushing Syndrome, characterized by increased levels of a hormone called cortisol in the blood. Affected people have high blood pressure, a round red face, abdominal obesity with thin arms and legs, weak muscles and bones, acne, fragile skins that heal poorly, changes in menstruation and chronic tiredness. 3. As a result of application of steroids to the eyelid, the development could occur of cataracts (whitening of the lens) and glaucoma (increased pressure in the eye) which are leading causes of blindness worldwide. 4. When absorbed in large quantities for a long time, steroids can cause thinning of bones referred to as osteoporosis which make bones easily fractured. Next time you want to use a steroid containing cream make sure it is on a doctor’s prescription only!! Mrs CEO Naija: Exposed! How Some People Make N200k Profit in 4-5 Months! 10 Things Your Man Probably Hates About You! Please am having darkening of the face please I need a good cream that will suit both my face and body.